Sunday, <?xml:namespace prefix = st1 ns = "urn:schemas-microsoft-com:office:smarttags" />November 23, 2008. This is a sad time for South Africa. 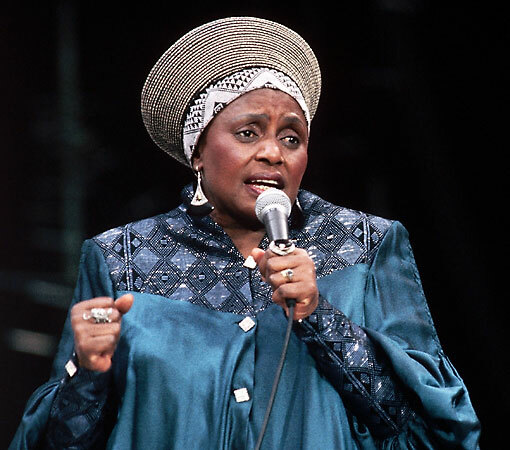 Miriam Makeba's death on Monday came as a great shock to me, and there is a sense of devastation here. There are some people you think are indestructible, with whom it is impossible to associate mortality, and she was one of those. We believed she had always been with us and that she would always be there. My country has lost a great human being. The very first time I saw her was in 1959. She was young but already a star, having sung with the Manhattan Brothers and the Skylarks. She was starring in the musical King Kong, and the song I remember her singing was a ballad called Back of the Moon. It was not about the Moon in the sky, however, but a shebeen. This was the show that took her abroad, to London and eventually America, where she would be taken under the wing of Harry Belafonte - and we owe him a debt of gratitude for that. She needed him to vouch for her because she was an unknown, but after that her success with songs such as Qongqothwane (The Click Song) was her own. I remember when she was forced into exile in the 1960s after appearing in a documentary about apartheid. In one sense, those of us still in South Africa were sad that another talented person had left, but so many others - our brothers and sisters, our leaders, our stalwarts - had already gone, and we knew that they were leaving under duress, and that it was not something they would have chosen to do. They would not have gone had the circumstances been different. Yet it was also good that people such as Miriam, Oliver Tambo and Thabo Mbeki were going forth and showing the world that we did not go around eating people, that we walked upright and that we wore clothes. Apartheid wanted to give the world that image of us. In spite of all the obstacles put in our way, Miriam Makeba emerged from South Africa with this beautiful voice. In that way, she became one of the greatest arguments against apartheid. When she spoke at the Anti-Apartheid Committee of the United Nations in 1963, she galvanised incredible support from the international community. People were surprised that she could speak so eloquently, so coherently, so intelligently. She was one of those who incarnated the absolute stupidity of apartheid. the anti-apartheid movement. Although she was not overtly political, her presence was a political statement. I remember going with her to a ceremony in Sweden a few years ago, where she was getting some award or another, and she could still captivate her audiences with that incredible voice. She was still amazingly agile on stage at an age when most of us have to have conversations with our bodies whenever we want to move. You really had to make an effort to realise she was getting on in years. She had managed to keep well and vibrant, and she had this great warmth. She was very attractive, too, and, I have to say, cuddly. She richly deserved the name by which she was known, Mama Afrika, but I am not sure South Africa truly gave her the recognition she deserved, and I hope some posthumous award may be given that rectifies this omission. She was exiled from her home for more than 30 years, but I will never forget the alacrity with which she returned to South Africa as soon as the atmosphere was more congenial and fantastic changes were taking place. Desmond Tutu was the Archbishop of Cape Town, 1986-96.